The food game gives rise to many entrepreneurs full of bright new ideas and concepts – which is all well and fine until it comes to the all important step of getting them to the consumer, as this article highlights. Supermarkets are a key route to market for many suppliers of food and household consumable products. The growth of supermarket chains in southern Africa presents important opportunities for suppliers, as it potentially opens up much larger regional markets for them. Supermarkets can therefore be a strong catalyst to stimulate suppliers in food processing and light manufacturing industries in southern Africa. But even the most efficient suppliers with competitively priced, high-quality products are unlikely to succeed if they can’t get their products to consumers. Here, large supermarkets play a key role. Onerous requirements and exertion of buyer power by large supermarket chains can result in small- and medium-sized suppliers and entrepreneurs failing to enter and participate in the economy. 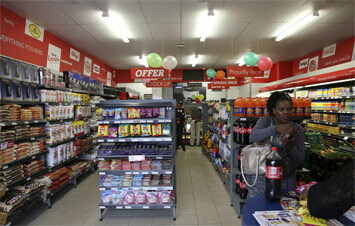 We examined the obstacles to accessing shelf space in supermarkets in Botswana, South Africa, Zambia and Zimbabwe. The research revealed a range of costs that suppliers incur even before a single unit of their product is sold off supermarket shelves in each country. Supplier development initiatives have been put in place by supermarkets and governments. But these have had limited success because they are restricted in scale and scope, are largely ad hoc, and don’t have a regional development perspective in mind. There is a need for more co-ordinated, sustainable and regionally focused interventions to increase the participation of suppliers in supermarket supply chains. These should aim to reduce barriers to entry by, for example, curbing supermarket buyer power and building capabilities of suppliers. The formal South African supermarket industry is concentrated, with only a handful of large chains holding more than 70% of the national market share. South African supermarket chains also have a strong and growing presence in each of the other countries assessed, although recent years have seen the emergence of other African and global chains too. Large supermarket chains, therefore, have considerable buyer power, and are often able to control pricing and trading terms with suppliers. This can include a range of fees such as listing or support fees paid by suppliers to get their products listed in supermarket books. These fees can be prohibitive for small suppliers. Estimates of listing fees in South Africa range from $350 to $3,500 per year for a single product line of a basic food item on the shelf. They can go as high as $17,000 to $20,000 for prime till positions for products like sweets and lollipops for a limited time period. In Zimbabwe, listing fees can be up to $2,500 per product line, with $50 to $100 for the introduction of additional new product lines by the same supplier. Suppliers are also often required to offer supermarkets settlement discounts for paying them within the number of days stipulated in the trading terms. This varies depending on the supplier. Long payment periods put considerable pressure on suppliers’ cash flow and working capital which is problematic particularly for small suppliers. Local suppliers in Zambia raised this as a key reason for non-participation in supermarket value chains although it was a concern in all the countries studied. paying to participate in different promotions held by supermarkets such as Easter and Christmas promotions. A range of other fees also apply, varying by supplier and according to industry. These include general discounts, fixed or variable rebates based on sales volumes, transport discounts and swell or wastage allowances. Cumulatively, the various fees can add up to at least 10-15% off the price of the product sold to supermarkets, placing considerable strain on supplier margins. General access to good shelf space often comes at further costs. It is critical for successful sales that products are displayed where shoppers can easily see them. Eye-level shelf space is often taken up by dominant suppliers. Similarly, access to refrigeration space is important for suppliers of cold products such as soft drinks, ice creams and frozen food. There have been competition cases [globally] (see more here) and in South Africa that have recognised the harm to competition of dominant suppliers imposing exclusivity requirements on fridge space. Over and above legal requirements such as compliance with national standards, food safety, labelling and packaging requirements, suppliers also have to adhere to private standards imposed by supermarkets. These can include barcoding and specific packaging requirements as well as sustainability criteria and religious requirements (such as halal and kosher certicfications). These can also include higher accreditation standards which often involve on-going audits at the supplier’s cost. Codes of conduct between suppliers and supermarkets can be a useful way to control the exertion of buyer power. In the UK, for example, the Groceries Supply Code of Practice was set up specifically to oversee the relationship between supermarkets and their suppliers following an inquiry by the former Office of Fair Trading. Similarly, in Ireland and Spain, there are plans to institute voluntary or mandatory codes of conduct in the grocery sector to govern commercial relations between suppliers and supermarkets in the food chain. We recommend that such codes also be set up in southern Africa. Given the multinational nature of supermarkets in the region, these codes can be harmonised across the region. Supermarkets can also play an active role in building the capabilities of suppliers. Almost all supermarkets in South Africa have some form of voluntary supplier development program in place. In some instances, large supermarkets have been mandated to set up supplier development programs. For example, as part of the merger between Walmart and Massmart, the merged entity was required to set up a supplier development fund. Around $16.7 million was allocated to be spent over five years to develop suppliers. Some aspects of the program involving farmers were unsuccessful. But there have been positive outcomes for some black entrepreneurs in food processing. One beneficiary, Lethabo Milling, a new entrant producing maize meal, received around $110,000 towards refurbishing his plant. And the company was able to secure a loan from a commercial bank on the back of a guaranteed route to market through supplying Massmart stores in South Africa. Lethabo Milling also received additional support through training, waived listing fees and fast-track payments. Successfully developing supplier capabilities in the region requires a much larger, long-term and commercially oriented approach by supermarkets in partnership with governments. This can be done through the creation of supplier development funds similar to the Massmart/Walmart programme. Funding can also come from fines levied by the competition authorities in abuse of dominance or cartel matters in each country. This article is part of a series of studies titled “barriers to entry”, specifically looking at the expansion of regional supermarket chains in southern Africa. The article draws from studies that look at the spread of supermarkets in the region and how the market power of large firms in different sectors can hold back economic development.